So it’s Friday around these parts, which means that by the time you’ve read this, the weekend will either already be in full swing or barely a mere step away from your greedy, outstretched paws. Which, of course, begs the question, what are you planning for your weekend? Me? Well, what I really want to spend the next 72 hours doing is demonstrated by Maddie, the family dog, in the picture above. 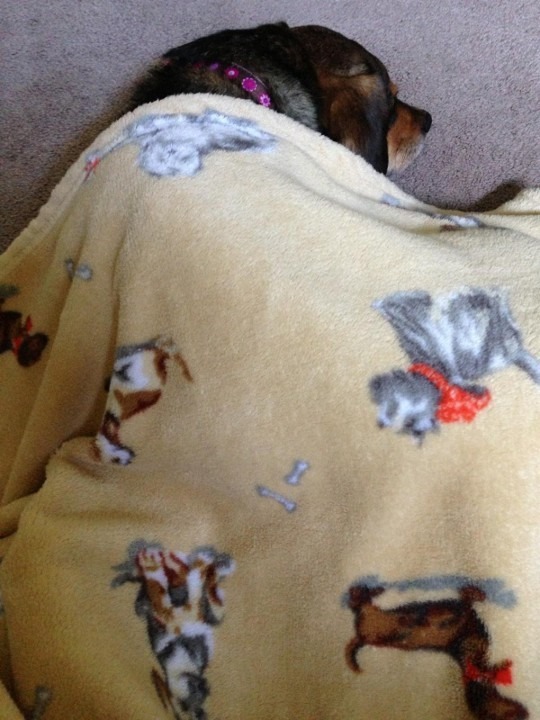 Yes, she somehow managed to snuggle herself into the blanket for a nice, cozy afternoon nap. I am shamefully envious of my dog, people. There, I admitted it. Sadly, I haven’t had the opportunity to lay about like a teenager following an all-night gaming session since I was, well, close to a teenager. Of course, back in my day (shakes a cane at the whippersnappers on his lawn), I had more all-night reading sessions than gaming ones. You know, because in the way-back times of rotary phones and rabbit-ears you had to actually get everyone in the same room to game successfully. Yes, it does sound like some kind of crazy fantasy. But that’s how we had to do it! Anyway, since laying on the couch for two days like a forgotten pile of grandma’s afghans is, sadly, not in the cards, I need to have other plans for the weekend. This evening, Aunt Babysitter has chosen to host all her nieces and nephews for a House Party of Massive Childhood Fun! As luck would have it, my children just so happen to be included in the set of her nieces and nephews. Which means that while they’re all breakin’ it down at the House Party, the Puddinette and I have free date time! W00t and huzzah! Trust me, I will eat enough to be excused. Afterwards, time permitting, there might even be a motion picture. I know, I know. That’s a lot of crazy excitement for one night! After our (child) free time tonight, Saturday morning will roll around and I’ll go for a jog. Then there will be a little league baseball game for the Elder Son (formerly known as the Puddinpop). At some point following that, I have to cut the grass. Also, hair cuts for everyone! We’re all hoping I won’t confuse which implement is intended for which manner of trimming. There will also be much much consumption of pumpkin ale layered with tasty, tasty stout. Because if that isn’t your favorite fall drink, well, I guess you can have that latte thing. But you’re doing autumn recreational beverages wrong, if you ask me. To wrap it all up, I’m going to make some attempt to learn how Magic: The Gathering work via the app from Wizards of the Coast I downloaded last night. Got any pointers for me? Anyway, that’s my weekend. No, it probably won’t be a thrill-a-minute, and it definitely won’t be the two-day couch-a-thon that it might have been in my mid-twenties. But, you know, it’ll be just fine for me. That is, I’m really looking forward to it. What are you plans? Autumn is here and in many places the weather is pretty all right (even if not quite as fall-like as I’d, um, like). So hit the comments below, twitter, or facebook and shed some light on what you’ll be doing with yourself for the next two and half days. Oh, and don’t set the place of fire.